NEW YORK -- A national retailer sold Chinese-made flooring that emits hazardous levels of formaldehyde, a carcinogen, a federal investigation found. The laminate flooring was sold by Lumber Liquidators until last May, when the company announced it was halting sales. The investigation was prompted by a March 2015 "60 Minutes" report that revealed the company's laminate flooring made in China had higher levels of formaldehyde gas than allowed by law. A long-awaited federal safety review, released Wednesday, found the flooring gave off enough formaldehyde to irritate the eyes, nose and throat of many people. There also was enough gas from the product to trigger breathing problems in people with certain health conditions, like asthma. The formaldehyde also increased cancer risks by a small amount. The Consumer Product Safety Commission, which oversaw the testing, is continuing its investigation and has not announced any penalties related to the findings. Lumber Liquidators did not dispute the new report's findings. "We support their recommendations and share their (the agency's) commitment to educating consumers," a company statement said. Based in Toano, Virginia, the company sells flooring at 375 stores in North America. The Consumer Product Safety Commission commissioned testing of samples of the flooring, taken from the same lots as samples examined by "60 Minutes." The samples had been manufactured six months to three years earlier. Testing was performed at three different labs. The results were provided to another federal agency -- the Centers for Disease Control and Prevention. The CDC and a sister agency analyzed the results to calculate the health impact of the detected levels of formaldehyde. Formaldehyde is a colorless gas with a pungent smell, used among other things to manufacture building materials and household products. It's a common indoor air pollutant. Researchers say the amount of formaldehyde given off by new products ebbs as time passes. Formaldehyde levels can vary widely from home to home. But on average, there are about 50 micrograms of formaldehyde per cubic meter of air, the report said. The analysis found the amount of formaldehyde released by the new flooring could increase that level by as much as another 280 micrograms -- a six-fold increase. Such levels can cause nose and throat irritation for many people. For asthmatic children, it can increase the chances that breathing problems will require hospitalization. "We estimated there is a health concern," said Pat Breysse, head of environmental health at the CDC and its sister organization, the Agency for Toxic Substances and Disease Registry. Long-term exposure to formaldehyde in workplaces has been linked to rare cancers of the nose and throat. Breysse said such exposures wouldn't commonly be seen in a home. But the analysis said there was a small added cancer risk from formaldehyde released from the flooring at levels seen in the testing. Investigators estimated between two and nine additional cancer cases in every 100,000 people exposed. Last week, Lumber Liquidators was sentenced in federal court after pleading guilty to environmental crimes related to Chinese flooring. The Department of Justice said the company made hardwood floors in China from illegally cut Mongolian oak trees in Russia. Those trees are needed to protect endangered Siberian tigers and Amur leopards because their prey eats the acorns from them, the Justice Department said. 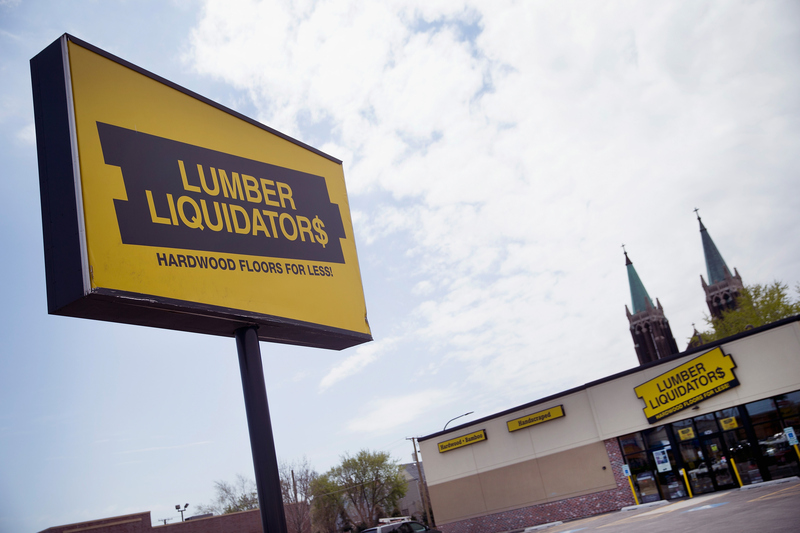 Lumber Liquidators will pay $7.8 million in criminal fines, more than $1.2 million in community service payments and nearly $970,000 in criminal forfeiture. It will also pay about $3.2 million through a related civil forfeiture. The company also agreed to a five-year probation period.